Light. It is often a challenge when you’re trying to take photographs indoors. Even though you certainly can take culinary photos outside, 98% of the time, you’ll take pictures of dishes you make at home. But fortunately, it is possible to conquer the problem of lighting. You simply need to know a few tips. That’s why I decided to devote this final article on managing lighting to share some little tips with you to help deal with the issue without having to create a full-on professional photo studio. It is of primordial importance to find first of all the right placement in your home to take advantage of the best available light. Despite what you might think, a room that is bathed in light isn’t the best spot to take good culinary photos. Yellow will dominate the scene and the ambiance will be too warm. Of course you can change your camera’s balance of light tones, however the result will still appear less natural, and you’ll have to spend too much time with your photos in the post-process phase. Over the long run, this will be a real constraint. 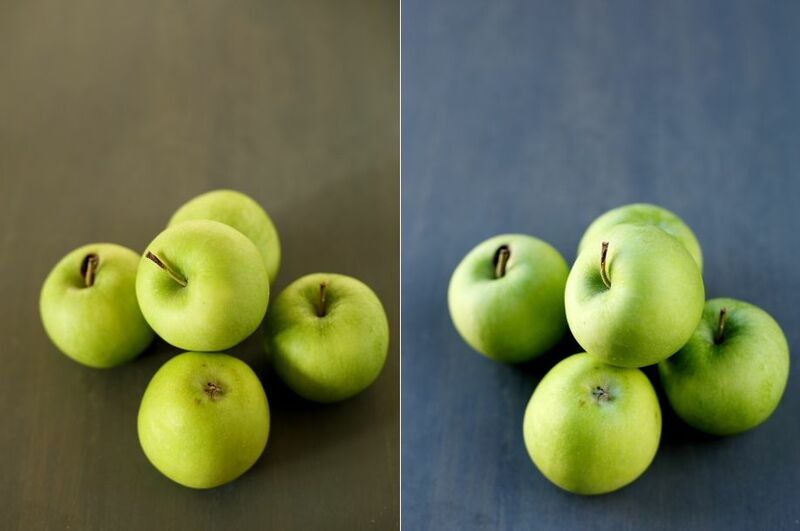 I photographed these apples in two different rooms at the same time of day. The photo on the left was taken in my dining room, bathed in sunlight. As you can see, the image is clearly too warm. My gray-colored background has become brown. The right-hand picture was taken in my kitchen. Because the sun doesn’t shine into this room, the ambiance is much cooler (so the background is gray again), but much closer to reality. You’re better off in a room without or with less direct sunshine in order to keep a certain neutral quality in the colors of your dish. Arrange the subject of your photograph near your window. The best would be to place it by a French door or a bay window. These openings give a room a much better level of clarity. However, if you only have ordinary windows, place the scene you want to photograph at the height of the window so the light will be more diffuse and create softer shadows. To get even more light into your interior, open the net curtains (if you have them) completely and open the windows. You’ll see the difference right away! The glass panes will play the role of filter. You’ll want to take photographs in a room where the walls are of a neutral color: white, light gray, beige. If your room is painted blue, dark pink, or orange, of course that color will be transcribed into your scene and it will modify the photograph’s colorimetry. It took me some time before I found the right spot in my home. I’m fortunate to have French doors in all my rooms. First, I took photos in my dining room, but because the sun shines in for a large part of the day, my photos were too warm. And then when there was no sunlight, there wasn’t enough light. So then I tried in another room where the sun never shines in. The problem there was that the room was so small I couldn’t assemble a large scene next to the window. Then finally it was in the kitchen that I found the best “spot” inside my home. No direct sunshine, French doors I was able to assemble a large scene in front of, and a room with neutral tones (gray wall). Tip: To find the best spot in your home, feel free to move around with the dish you want to photograph to observe the effect of the light. Take pictures of your scene in different rooms and compare the results you achieve. Where did you take the more beautiful photo? Now that you have found out where to take the picture, you need to figure out when to take it. Observe how the light changes in your room throughout the day. Often the light is most intense between noon and 2 in the afternoon. But each season has its particularities. Summer is the best season so long as you avoid having sun shine into your room the whole day long. You can take your photos from 9:00 am to 5:00 pm! So it’s perfect to practice with no limits. But in winter, the weaker light will mean that you need to photograph from 11:00 am to 2:00 pm, or even 3:00 pm if the weather is clear. In addition to the duration of sunshine, the strength of the light is also a factor, and it changes throughout the day. 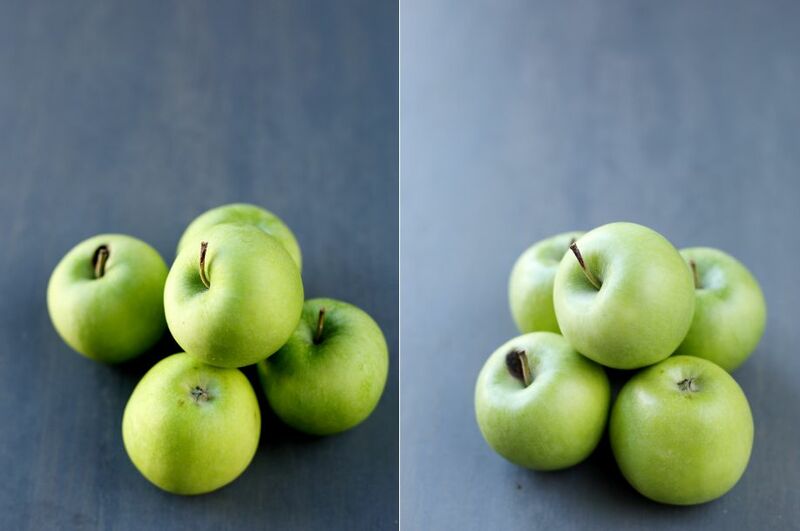 Above is an example of apples photographed in the same spot in photos taken 4 hours apart. You can see how the light is different. The photos on the left were taken at 9:00 am. The shadows are rather strong, the background is very dark, even while the apples are correctly exposed. On the right, the photo was taken at 1:00 pm. The atmosphere is much more natural, softer, and more neutral. Also, the background is lighter. According to the position of the sun in the sky, the light will have a softer or harsher effect and will be either more yellow or more blue. In fact, you can see the difference in colorimetry between the two shots. Note how the light diffuses in the room in order to find the right moment where the light truly enhances your dish. Note: When you’re taking photos in natural light, you need to be able to adapt to the weather conditions. Here’s the perfect example: there are days when the sun and the clouds alternate in the space of a few seconds. These changes will have an immediate impact on your photos. Suddenly, your scene is bathed in a beautiful light that is slightly warm, well-balanced, and then a cloud passes over and the scene is left darkened and bluish. In this case, your only choice is to wait for the sun to return so you can maintain a harmony across all the photos you take. The issue with taking photos indoors is managing shadows. If the light is placed on the side, without fail, the other side will be marked by the shadows made by the various elements that are placed in the scene. In the same way, if you place your scene in front of your light source, the shadows are placed on the opposite side. However, there is an affordable accessory that is extremely useful in softening or preventing shadows: that accessory is the reflector. These photos were taken with back lighting. Here you can clearly see the difference between the two images. 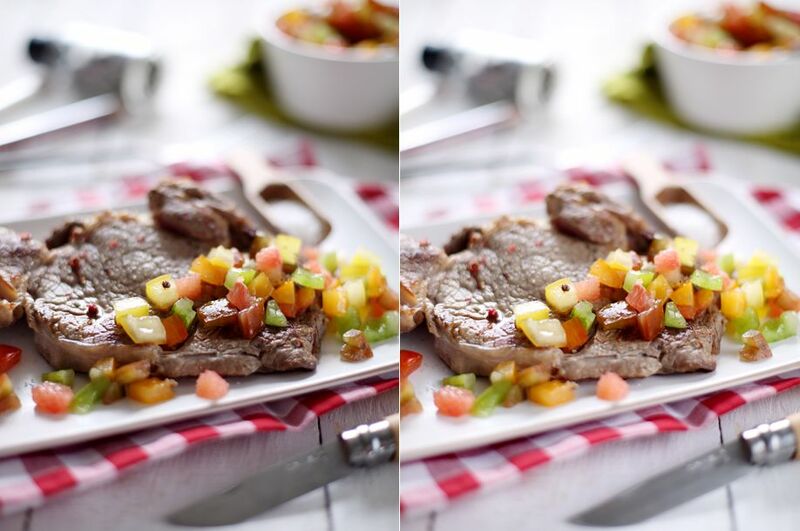 Using a reflector for the photo taken on the right immediately sheds light on the tomatoes and the meat. The shadows are much softer. The reflector is an accessory in the shape of a large circle covered with a fine metallic film that will reflect light. The reflector is placed across from the light source. If your window is to the left of the scene, you’ll place your reflector on the right. For a scene placed with back lighting, you don’t put the accessory across from the window. Then you won’t be able to take a picture. 😀 Put it on either side. 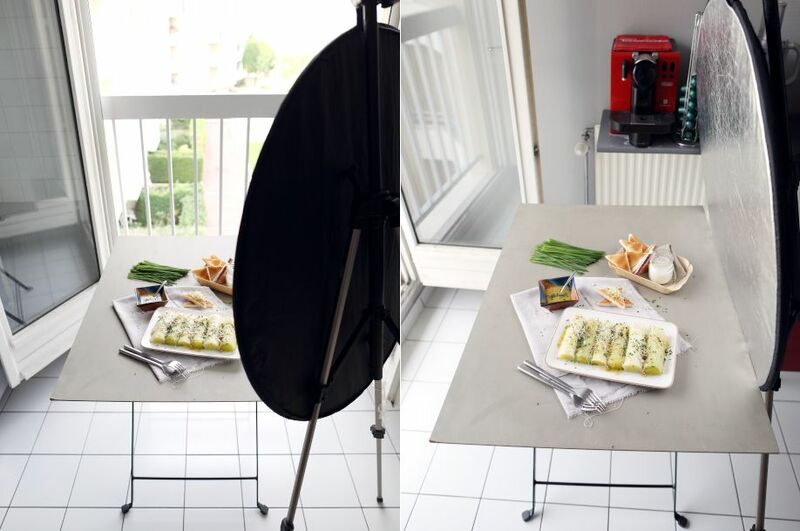 For the picture on the left, when I photograph with back lighting, I place the reflector on the right so that I can position myself in front of my scene. The shadows will still be eliminated. For the picture on the right: it’s much simpler, when I put my scene to right of my window, the reflector will go on the opposite side. A reflector costs about €20. Still, if you don’t have any money to spare, there are some small, low-cost tips to resolve shadow problems. For example, look at the backing that smoked salmon is packed with. Have you noticed that these boards are reflective? To get a reflector that will be big enough, you should glue several together so it will work for the entire scene you’re putting together. Aluminum foil also works well. Find a rigid base to cover with aluminum foil. A thick piece of cardboard will do. The reflector is not an indispensable tool. Look at these two images. 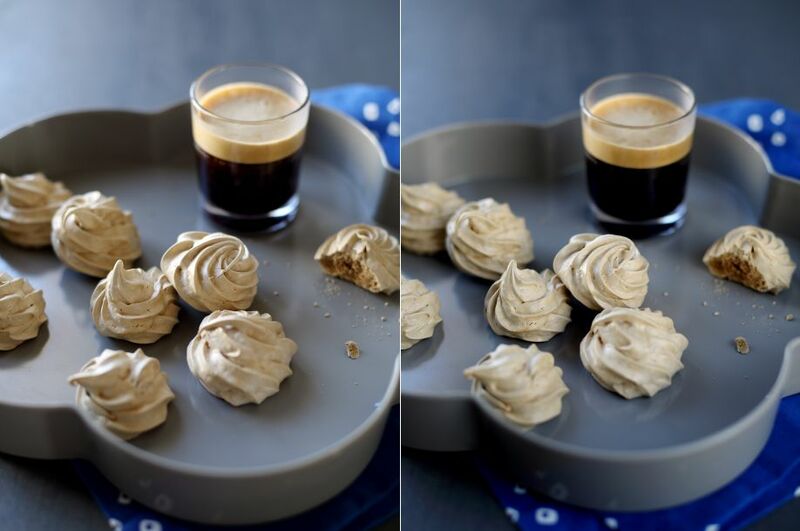 The light in the photo on the left highlights the relief of the meringues. Grooves are well pronounced. For this shot, I didn’t use a reflector. On the other hand, the light is completely different with a reflector placed to the right. The relief in the meringue is much less distinct. The result achieved is much less interesting. Is your light wrong? Change the ambiance. Whatever you do and no matter where you move, does your place still lack adequate lighting? That doesn’t mean you should just give up. Whoever said a picture had to be absolutely luminous? 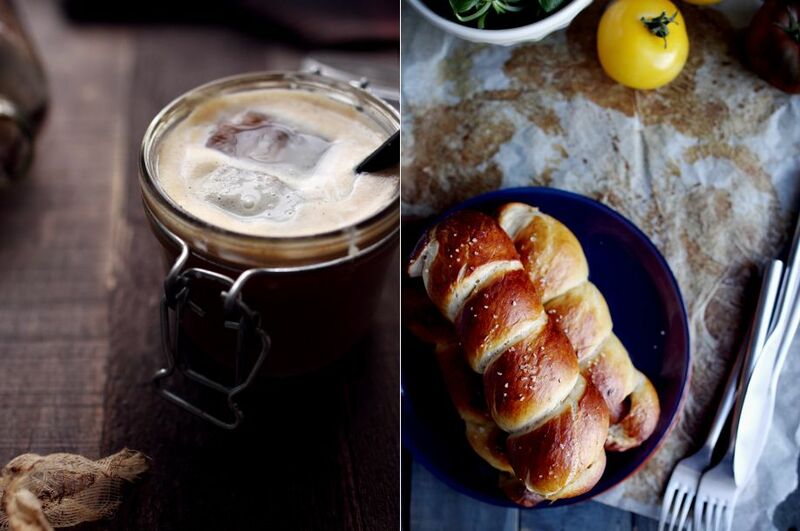 Think differently about your culinary photography. Take advantage of weaker lighting to create a darker ambiance with less pronounced color, and afterward adapt to this in your post-processing steps. Black, brown, gray, and dark blue are good colors for this type of ambiance. If you are working with white, it will appear gray, dirty, and you’ll see this lack of light. I tend to recommend against this unless this is the style you’re after! There are no hard and fast rules. Position yourself relatively close to your window to illuminate a part of your scene and leave the rest, for example, in the shadows. You should still use a reflector when the shadows are really compromising the scene you want. You may discover a style you wouldn’t have thought about but you actually come to like in the end. To conclude, here are some examples of photos I took on rather dark days (dark either because of the weather or because I took them late in the day). I adapted the conditions of the scene using a darker ambiance. Post-processing was very important to bring some light to the main subject. I wasn’t trying to soften the shadows. On the contrary, the ambiance I achieved gave the image a very interesting “cocooning” effect. 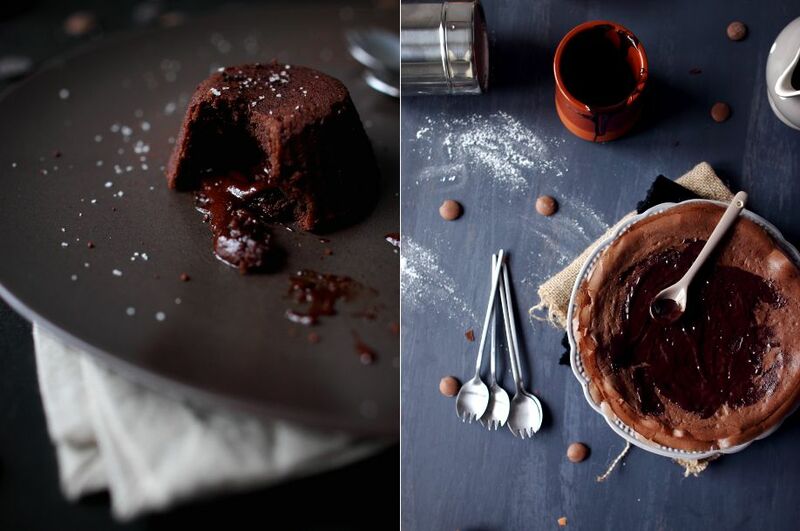 Now, I wish you lots of success creating your own delicious photographs! Under the pseudonym of chefNini, Virginie has kept a culinary blog by the same name since February, 2008. It features her creations, her inspirations, and her tips presented through instructive articles. Autodidact and passionate about her interests, she decided to quit her job as a web developer to devote herself exclusively to her blog. In September, 2011, she became an entrepreneur, offering her services as a creator, photographer, and culinary writer. She is also the author of a book on culinary photography published by Pearson.